Summer weather in fall, but still getting ready for winter. I made a few of these washer necklaces for the winter wardrobe for myself and friends. 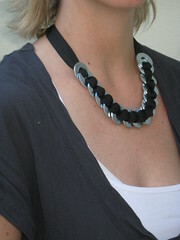 Again, excellent tutorial to make the necklaces over at The Small Object.